The Dominica Labour Party (DLP) did not hold a delegates conference, as the party planned at Londonderry on 17 February 2019. But the DLP is giving no explanation to the press or to anyone else. That's bordering on extreme arrogance or dictatorship, political observers have told the Sun. When contacted for reasons why the DLP failed to hold its delegate's conference as announced, Edward Registe the last party secretary said that this had "long past" and "call the political leader, I am not the PRO…I can't speak on that." Registe was asked to name the party's current public relations officer (PRO) since Dr. Philbert Aaron, the last one, had resigned. Registe declined to give details. "Call the party leader", he said smiling. However, all calls and or messages to the party leader, Prime Minister Roosevelt Skerrit, on that matter and other matters have not been answered or returned. Recall that Registe, speaking at a press conference a few days before holding of the Londonderry "delegate's convention" explained that the necessary machinery was being put in place for the DLP to hold its delegates conference then. Recall also that the DLP has not held a delegate's conference since its September 15, 2013 conference in Pointe Michel where the entire executive was elected unopposed via a resolution. Speaking at a DLP press conference on February 6, 2019, Registe said that the reasons for the delay in not holding the delegate's conference were caused by Tropical Storm Erika in 2015 and Hurricane Maria in 2017. "The reasons for not having one over the years as is required by the constitution, is because, as [the] party in government, we had to prioritize the reconstruction and rebuilding after tropical storm Erika and Hurricane Maria and the government was plunged into this whole effort over the past few years and we had to prioritize," he said. He continued: "Now that the country has rebounded we felt it was time to go back to the party to focus on our delegate's conference. We had our National Council Party meeting…and a date was given as February 17, 2019 for the delegate's conference where 210 delegates will have the responsibilities of electing a new executive to run the affairs of the party. There are a few vacancies but not sure if there will be many changes. "As part of our annual responsibility, the party must have its delegate's conference and that delegate's conference is part of the requirement of the constitution of the party. So, it is that time again and as you would know, we have not had a delegate's conference in a few years and we felt it necessary to now have one." However, when the press arrived at Londonderry, no delegate's convention was held. 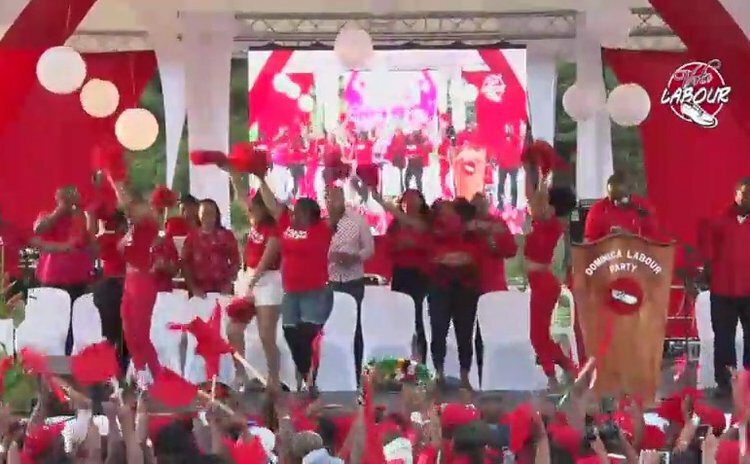 Instead, in a grand rally, party leader and Prime Minister Roosevelt Skerrit named 15 new persons to contest the next general elections. "This shocked us, since we came to Londonderry to have the delegate's convention but that did not happen and no explanation has been given," a DLP insider told the SUN. The source also told the SUN that members of the party are "unhappy" that as promised there is still no delegate's conference. "We have many vacancies in the executive to be filled; the post of PRO, president and vice president are all open and have to be filled. The party is functioning without a proper executive and that is undemocratic," the DLP insider said.